Hot dog on a baguette?! Oui. Call it what you will–French, Parisian, froufrou, fancy—but we call it brilliant. And so will everyone with whom you share this party trick. 1. Preheat the oven to 400°F (204°C). Bring a small pot of water to a boil. 2. If using a regular-size baguette, slice off an end and cut the baguette into a length slightly shorter than your hot dog. If using a demi-baguette, slice both ends off. Cut or rip out some of the fluffy baguette interior to make space for the hot dog. 3. Simmer the hot dog or sausage until warmed through. While it cooks, place the baguette in the warm oven to toast slightly, just for a minute or so. 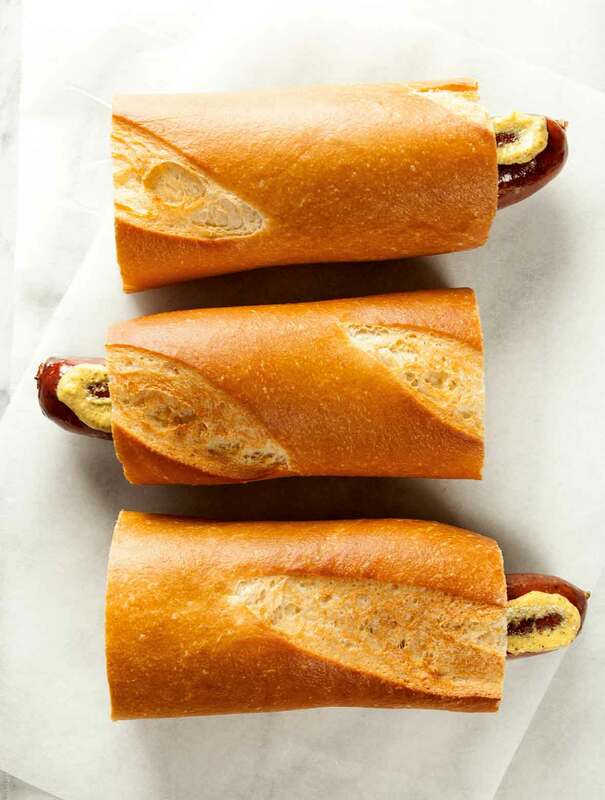 Slice a baguette or demi-baguette as you would a classic hot dog bun and spread with the spicy mustard. Eighty-six the ketchup. (That means forget about it.) Add the hot dog or sausage and then a generous helping Gruyère cheese. 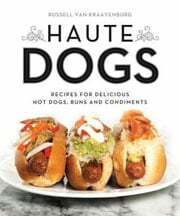 Heat the haute dog under a broiler until the cheese is melted. Serve pronto. Slice a baguette or demi-baguette as you would a classic hot dog bun and spread with the spicy mustard. Eighty-six the ketchup. Add the hot dog or sausage and then a generous helping of Brie cheese. Heat under a broiler until the cheese is melted. For a sweet touch, add sliced pears or apples before topping the dog with Brie. Hot Dog on a Baguette Recipe © 2014 Russell van Kraayenburg. Photo © 2014 Russell van Kraayenburg. All rights reserved. All recipes and photos used with permission of the publisher.